Here's a six unit veneer case I built. They're feldspathic veneers to be exact. Feldspathic porcelain is the most common and popular material for cosmetic dental restorations. The reason is because in the right hands it creates the most natural look. You can use it to reach the highest aesthetic results. If used to make 'thin veneers' the process can be less invasive to the patient -- the patient keeps more of his or her natural tooth structure. But it also has some limitations. For instance, because feldspathic veneers are a thin layer of porcelain and cover one third of the tooth's surface, the underlying natural tooth color could show through. This can happen when the natural tooth color is much darker than the desired color. If this is the case, feldspathic thin veneers may not be suitable. We'd most likely use another material or method that does a better job of blocking the underlying color like pfm or zirconia crowns. Model of patient's mouth, prepped for a new set of veneers. 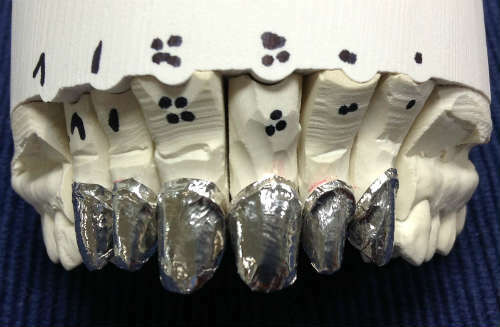 Platinum foil is placed over the model where the veneers will go. The first layer of the veneers built over the foil while mounted on the model. In this stage we can manipulate the veneer's opacity (how much of the tooth's natural underlying color we want to block). The veneers taking their final shape. 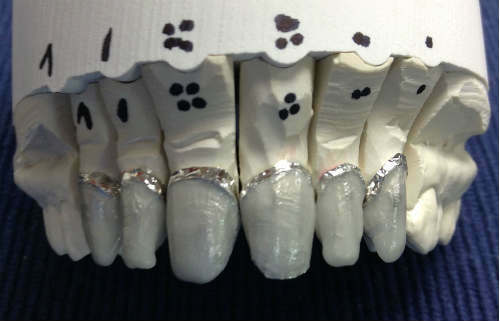 Each individual veneer on its own (foil removed). 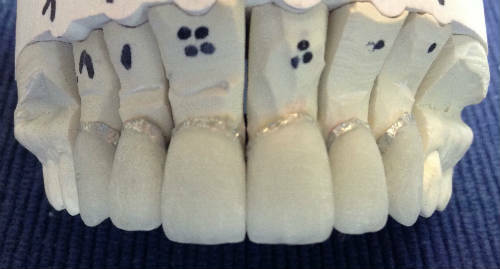 Like little gems ;-) Glaze and color has already been applied, and the veneers have been shaped to fit the mouth and individual smile design of the patient. What these veneers look like from 'inside' the mouth. 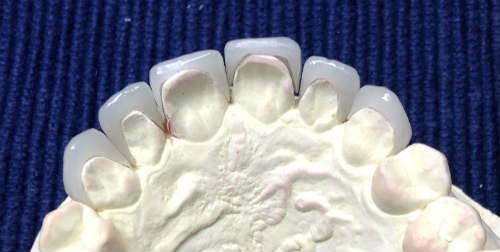 The six unit veneers, front view, mounted on the model one last time before sending to the dentist to place into the patient's mouth.